Friendship groups are perfectly normal. They make you feel like you really fit in and belong. Friendship groups form because the people in them have something in common. For example, the “jocks” play sports together, the “skaters” skate together, and so on. However, when these groups are restrictive and will not let other people be a part of their friendship group – then it is a clique. Cliques sometimes have strict rules and specific ways of acting. Cliques like to show off how popular they are. Sometimes, cliques hurt others by excluding them or by picking on them. Are there any positives of cliques? What are the negatives of cliques? Well, how do I cope with cliques at my high school? Understand your values. Do you actually want to be a part of this clique that picks on people? If you are feeling excluded from a clique, participate in other activities where you will feel like you belong. If you like to run, join a running club. 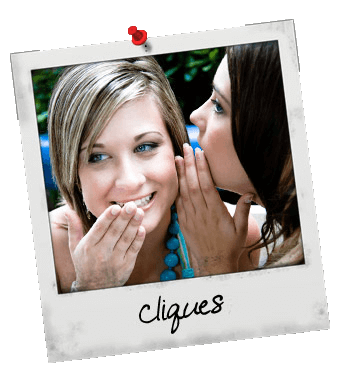 If you are part of a friendship group, don’t exclude people the way cliques do. Make everyone feel like they can hang out with you and your friends. If your friendship group starts to act like a clique, speak out and tell them it is not okay.